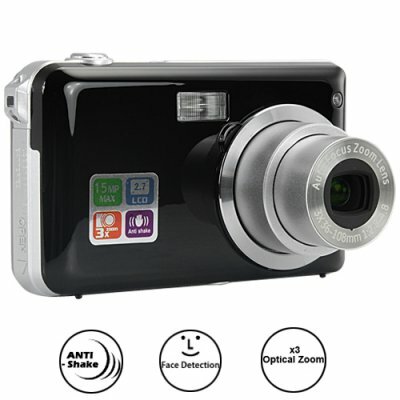 Successfully Added 5MP Digital Camera with Face Detection + Optical Zoom to your Shopping Cart. 5 Megapixel Digital Camera with enhanced usage features like face detection and optical zoom and video recording at up to 30FPS. Don't think for a moment that senior citizens are out of touch or can't get into high tech gadgets. They love cool and interesting electronics just like we do. Case in point...I'll never forget the joy on my grandma's face when I gave her the CVSE-DV19 as a Christmas present. Since then, she's been addicted to taking pictures and at least once a day posts to my Facebook wall. Oh and you should check out her Flickr page! Oh I really like the design Ducky! (Yes my grandmother calls me Ducky). It's small but not too small. You don't want to carry a brick with you when you take pictures, but a camera should not be too small or else one has trouble pressing the button. Not this camera deary. It's a perfect darling. Just like you. Also I am not big of fancy colors. I like the classic look and this camera looks like a camera should. The 2.7 inch display is good, especially for my eyes. The menu letters come out clear. I also love the image stabilization. Great for my arthritis! To tell you the truth, when you first gave me the camera, I was afraid I wouldn't be able to use it. But now I don't ever want to stop. I was invited to join a Flickr group recently as a result of an image I took of a baby eating ice cream. Oh you should have seen the smile on his face. One man from Italy left this comment on my Flickr page "Like a Cherub! Fantastico!" The CVSE-DV19, great for grandmothers and other gadget lovers. Give it as a gift or resell them on your online store for some great profits! Add to cart and it ships next day. Brought to you by your source for China factory direct electronics - Chinavasion. Does the DV19 come with a self timer?